Long time since I have updated and I will. I have so many new things on the go and am very excited. I actually have too many things on the go, and really just have to sit down and focus on one or two things, set them up and then add more. My first big project right now is starting a tanning business with a close friend of mine. 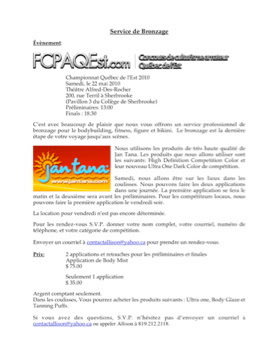 I will be offering back stage tanning services as of May 22nd starting with a local show that is going on in my area – Sherbrooke, QC. It is the FCPAQ Est. Follow www.fcpaqest.com for more information on the show and times of prelims & finals. For the tanning services I am listing both an English and a French writing of the service as my clientelle is primarily French. I am very excited to be helping the athletes present the best they can on stage. The tan is the final step to heading the stage, and can have affect on your final placing if things don’t go well. I will update further on my other events since the Arnold. I just have to say that I am in a very good place in my life right now, and having so much fun. Please do not hesitate to contact me for any questions on the tanning. Yes! Good luck! Wish you lived here!